Last year the European Court of Human Rights ruled that the British Government cannot maintain its blanket ban on prisoners being disqualified from voting. David Cameron, one eye always fixed on the Daily Mail front page, hyperbolically declared he would feel “physically sick” if prisoners were allowed to vote. Nonetheless a response was still needed, so a Bill was drafted with three options to keep everyone happy: options A and B would give the vote to all those serving sentences of less than 4 years or 6 months or less respectively; option C would re-state the existing complete prohibition on all convicted prisoners voting. In a democracy the vote is a right, not a privilege: it should not be removed without good reason. The vote is a presumptive, not an absolute right: all democratic states restrict the right to vote in order to achieve clearly defined, legitimate objectives. The vote is also a power: citizens are entrusted, in voting, with an element of power over their fellow-citizens. There is a legitimate expectation that those convicted of the most heinous crimes should, as part of their punishment, be stripped of the power embodied in the right to vote. There is an element of arbitrariness in selecting the custody threshold as the unique indicator of the type of offence that is so serious as to justify loss of the vote. 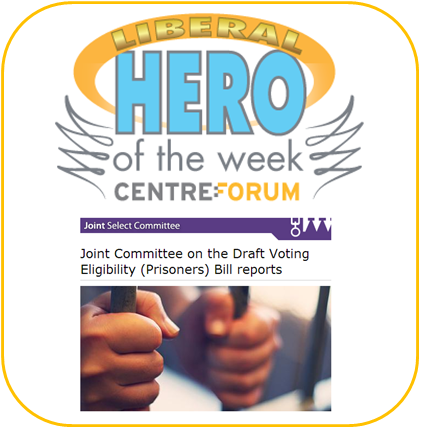 There are no convincing penal-policy arguments in favour of disenfranchisement; but a case has been made that enfranchisement might assist prisoner rehabilitation by providing an incentive to re-engage with society. The enfranchisement of a few thousand prisoners is far outweighed by the importance of the rule of law and the desirability of remaining part of the Convention system. Not all members of the Committee agreed with the majority verdict (it was passed by 8 votes to 3, with chairman Nick Gibb cleaving to the illegal ‘blanket ban’) – but at least they looked at the evidence before reaching their own principled judgement on a difficult “where do you draw the line?” issue. For that they all deserve recognition. Here’s another person who deserves recognition… though for a wholly different reason. Rates of pay for those working average around £10 a week and can be as little as £2.50 a week for a prisoner who is unable to work – out of which they must pay for phone calls, TV rental, stationery, reading material and any additional food, clothes and toiletries they may need. It costs 20p a minute to call a mobile from a prison phone during the week; and 9p a minute to phone a landline. Under the new rules the prison governor’s discretion is limited but it is up to individual governors to decide what counts as exceptional. Items allowed could include disability or health aids, items needed for religious observance, stamped addressed envelopes or replacement clothes where there is limited or restricted access to the laundry. The impact of these new rules is being monitored by Ministry of Justice officials responsible for safer custody and ongoing work to reduce self-harm and suicide in prison. 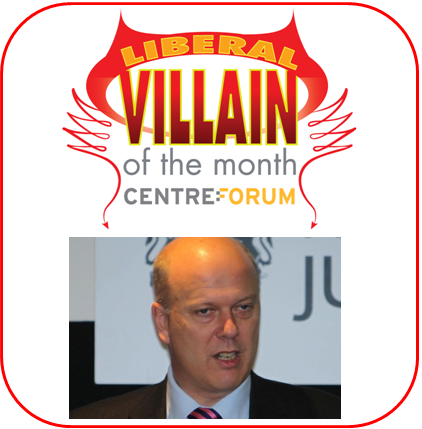 If anyone deserves a visitation from the Christmas spirits tonight it’s Chris Grayling; he could do with some rehabilitating.